Look no further if you're looking for a meaningful volunteer experience in one of the most dazzling and diverse countries in South America! Volunteer in Ecuador, and experience the enchanting array of topography and exquisite culture while contributing to society. How would you like to wake up to the dramatic heights of the Andean mountains, the diverse Amazonian jungles, gorgeous colonial architecture and fascinating Incan ruins? Volunteer in Ecuador, and have the opportunity to discover the cultural splendor and extraordinary nature of the country. Costa Rica is also home to the famous Galapagos Islands, Andean mountains the Cotopaxi volcano, and Amazonian rainforest, attracting thousands of tourists each year. Amidst the growth of tourism however, Ecuador is still an underdeveloped country and could use all the help to be on par with the rest of the world. New Hope's projects are located in Quito, the first city ever to be certified as a UNESCO World Heritage Site. Through our programs, you'll be able to improve the lives of marginalized communities in Ecuador, while taking in the majesty and charm of the beautiful country. Get in touch with us now and embark on a journey of a lifetime! The volunteering programs in Ecuador fees will cover expenses that will begin on the first day of the program (usually the first or third Monday of the month) to the last day of the program. If you arrive before the first day of the program or you decide you stay beyond your program’s last day, you will be responsible for the additional expenses, which would typically be around $30 a day for room and meals at a hostel. New Hope Volunteers will arrange for the accommodation and meals throughout the volunteering duration in the Ecuador program. Volunteers will be staying with a host family during the program. If you are undertaking the conservation projects, you'll be staying at a hostel instead. You might be sharing a room with other volunteers, a fantastic opportunity to swap stories and experiences. Our host families have all been carefully screened before being selected to participate in New Hope's volunteer programs. Our host families also have significant experience in accommodating international volunteers. Your hosts will provide you with a warm, comfortable and secure place to stay, while giving you the wonderful opportunity to learn about Ecuadorian culture. At least one member of the family will be able to communicate with you in English. Your host families will also provide you with 3 local meals, all of which will be clean and hygienic. If you require vegetarian options, New Hope will be able to accommodate; simply let us know when filling out the application form. New Hope also offers extensive support for you so that you feel right at home while volunteering. We offer many layers of support in Ecuador, as and when you require. The main person supporting you throughout your program will be our country coordinator in Ecuador, who is also in-charge of your volunteer program. Whenever possible, the coordinator will call or visit you to see if you are happy and satisfied with your project. You will also have the coordinator's mobile phone number that you may call any time you wish to discuss anything. Our project staff will also guide and help you throughout the program. 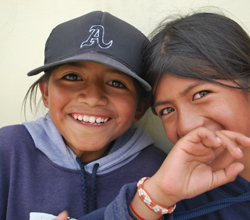 You will meet the project staff daily during your volunteer work in Ecuador. Who manages the volunteer projects in Ecuador ? What is the language spoken in Ecuador ? When are the Ecuador-based projects available? How long can I volunteer in Ecuador ? Who will arrange my flight to Ecuador ? When should I arrive in Ecuador ? When should I depart from Ecuador ? How safe is Ecuador ? What are the sanitary conditions in Ecuador? How do I make contact with New Hope Volunteer's local representative? How do I contact my family once I arrive in Ecuador ? Is there a special dress code that I should follow while staying in Ecuador? What should I know about Ecuadorian religious conduct? How do I respect the Ecuadorian people? What is weather like in Ecuador?